Don’t bin unwanted clothing because many livelihoods in Africa depend on the textile recycling trade- though not without controversy. On a recent visit to Zimbabwe I visited the vast indoor clothing market in Mbare. 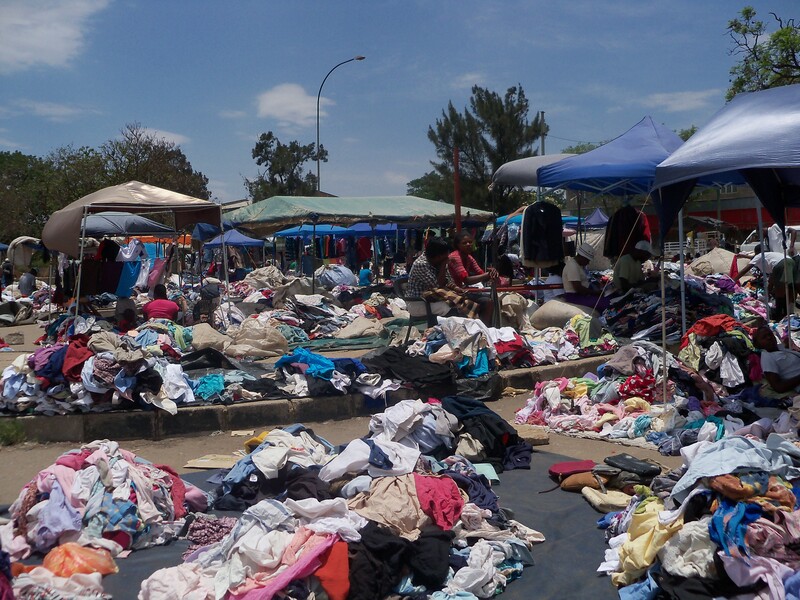 Situated in one of Harare’s high-density suburbs, it is the city’s major second hand clothing market. The market is bustling and the sound of the traders touting for business is deafening. Everywhere you look people are wading through discrete piles of colourful clothing on the floor. Luckmore is 29 and has been selling clothes at the market for four and a half years. He introduces himself as an artist / musician but sells clothes to make a living. He buys bales of clothes from a merchant in Mozambique. He pays $100 for each bale and is able to sell on its contents for $250 in two days. He pays daily rent of $20 so makes a profit of $50 a day. Some Zimbabweans I spoke to felt that cheap western second hand clothing imports had ruined the local manufacturing textile business. Others were more positive, recognising that it creates employment and people could now buy decent clothes at affordable prices. Nigeria has banned imported second hand clothes although the country has lots of thriving second hand clothing markets, the clothes from which come in illegally. In Kenya, five million people are employed in the clothes re-selling industry. Many countries cannot make clothes cheap enough to dress the expanding population nor have the cotton growing industry to support this, as in India. Lobengula is the clothing market in Bulawayo in the south of Zimbabwe. The locals refer to it as Khotama, which in the local Ndebele language means to bend over. It is an open market situated on some bare ground at the edge of the city. The day I visit, it is baking hot. The rains are late and the sellers are sitting under umbrellas to shield themselves from the midday sun. It is the middle of November and the market is quiet, although I am told that it will pick up after payday at the end of the month. A clothes seller I speak to travels to Mozambique to buy her bales. She pays $100 per bale and can sell them on for $400. There are other local women employed to man the stalls who have their babies sleeping among the clothes. They earn just $60 a month and work six days a week but say they would earn nothing if they stayed at home. As I leave, a heavily pregnant woman with a baby wrapped to her back is going through a large bundle of childrens’ clothes hoping to find some baby grows for her expected baby.